It’s a magical time of year. Everyone’s in a celebratory mood, family gatherings abound, and often, budding romances turn into engagements. 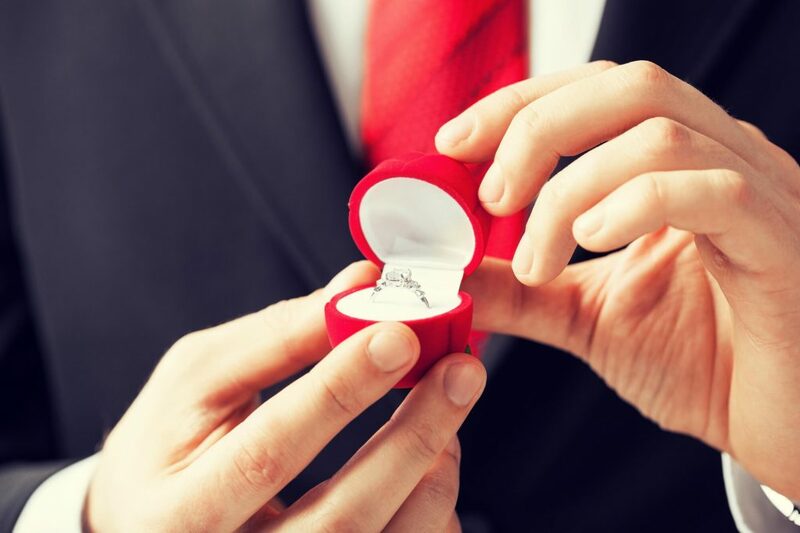 If you’re planning to pop the question during Thanksgiving, Feast of Our Lady of Guadalupe, Hanukkah, Winter Solstice, Christmas, Kwanzaa, or New Years, give one of these ideas a consideration. It’s time to elevate your relationship. You have the ring picked out – now, it’s time to decide when and where to pop the question. 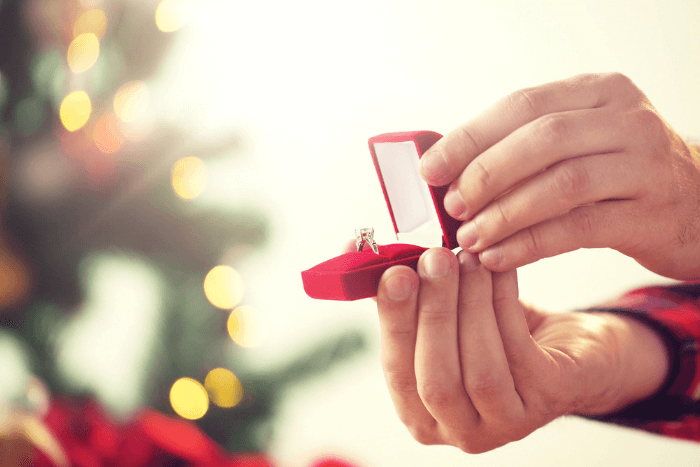 The holidays present several opportunities for meaningful, memorable proposals. If you’re gathering for dinner with members from both families, consider including everyone in the big moment. Give the event host a heads-up on your plans, so it can be woven into the gathering seamlessly. We love the idea of sneaking away for a few minutes just before dessert, slipping into a tux, and coming back to the dinner with a covered silver platter in hand. Initiate a toast with the free hand, speak a few words of love for your sweetheart, then unveil the ring on the platter. After she says “Yes!” the family party can continue with both the holiday and the engagement to celebrate. Do you envision a private one-on-one proposal moment? Plan alone time with your soon-to-be fiance during a holiday weekend before the main festivities begin. You might be able to carve out extra time the night before gathering with family or in the morning before an evening holiday celebration. Plan a meet-up at a favorite location (maybe at a festival of lights display or local park during a gentle snowfall) to relax for a bit before the busy weekend gets underway. They’ll be all smiles when you show up in a trendy suit complete with tie and jacket. Take them by the hand, go to a quiet area, and tell them how much they mean to you and that you want to spend every holiday with them forever. Then, ask for their hand in marriage. You can keep the moment to yourselves, or share the big news when meeting up with relatives for the holiday. If you have a close-knit group of friends that share in absolutely every part of your lives, including the holidays, it might be fun to weave them into the proposal. Team up with your best friend and brainstorm a few ideas that allow you and your partner to have a few minutes alone followed by an afternoon or evening of merriment with the people you both consider extended family. For example, a holiday-themed couple’s wine tasting at an exclusive winery could easily morph into a surprise group dinner in an adjacent wine room, complete with a sea of bow ties and little black dresses. If you live in a warm climate, take the same approach with an impromptu skydiving session or hot air balloon ride with friends waiting on the ground in Santa hats to congratulate you. Whether you choose to incorporate family and friends or make it a shared moment just for the two of you to savor, Jim’s Formal Wear can help you look your best this holiday season. Browse our special occasion formal wear for men online today to find the perfect proposal look.